We are no longer accepting article submissions. February 10 (for Mar/April edition), April 10 (for May/June edition), June 10 (for July/Aug edition), August 10 (for Sept/Oct edition), October 10 (for Nov/Dec edition), December 10 (for Jan/Feb edition). 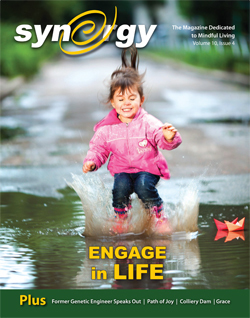 Articles in Synergy Magazine are the reason readers love the publication. The articles are inspiring, empowering and informative; offering practical tools to incorporate into our daily lives. Article submissions are always welcome. As this is truly a community publication, writers of all experience levels are encouraged to send their submissions. Preference is given to Canadian writers. Articles may be edited for brevity and/or clarity. Statement on Self Promotion: If you are a business owner, you are welcome to educate or share information about your industry, but please be tactful – do not mention or promote your own company, services or products in the article or bio. Advertising rates are available for just that purpose, and the support through advertising is what assures that Synergy continues to be published. Advertising and articles are treated separately; we do not print advertorials. If we decide to publish an article submitted by an advertiser, it will be printed on a different page… because having them on the same page would essentially create a full page advertisement! Length: approx. 500 to 700 words. – All wordprocessing programs have a “word count” tool. – Longer articles are the “feature” articles. These articles are discussed and agreed upon between the writer and Synergy Magazine prior to publishing. If you have an interest in writing a feature, please contact us before submitting the article. – Please note that computers are not typewriters – there is only one space after a period. Text: The online form ensures that we can read your article submission. If you email the file rather than using our online form, the file type will need to be a .txt, .doc, .rtf or .pages file. We cannot open .wps files. Subject: Varies, but must be in line with the theme of living more consciously. – This includes health, wellness, spiritual growth, social & environmental responsibility, sharing experiences that will touch others or challenge them to think differently. – If you have an idea for a subject that does not quite “fit”, please contact Synergy Magazine ahead of time to discuss the relevancy. Bio: Send a short, 1 to 3 sentence byline for the end of the article. Contact information is usually not printed. The only time we “may” print contact info is for volunteer work and not-for-profits. Photo: 200dpi – 300dpi resolution head and shoulders photo. ie: Photos taken from a website are not a high enough resolution for printing. Please note: There is no guarantee if your article is accepted, which edition it will be published in. We do our very best at Synergy to include as many articles as we can.